Another busy week at Deepdene! On Monday, Ms Hayward led an extended assembly to celebrate the start of Black History Month. Pupils had the opportunity to learn more about the life of Harriet Tubman. It was fascinating for us to hear about how she rescued approximately 70 enslaved people, family and friends, using the network of antislavery activist and safe houses known as the Underground Rail Road. On Wednesday it was a pleasure for me to open the DPA Annual General Meeting. It was lovely to see so many new faces and for the DPA to share dates of events planned for the year and to hear more about Project Playground, the plans for improvements to our outdoor spaces. The DPA have had a hugely successful year fundraising for Project Playground and we are excitedly looking forward to phase one of the improvements starting in the October half term. A huge thank you to you all for your support. On Tuesday, Mrs Croucher and I interviewed all the pupils in Year 6 for positions of responsibility in the school. Again, another proud moment for us as leaders to see that our senior pupils are so committed and eager to take on positions of responsibility within our school community. Every pupil had done a great job of fully preparing themselves for their interview. We will be ready on Monday to share the results with the pupils who we have selected to take up the various positions for the forthcoming year. I shall share this with you all in my letter to you next week. A very well done to all of Year 6 for their commitment and effort, we have an exciting year ahead with such a strong team of young people. Yesterday Mrs Croucher led the SLT assembly and the focus this week was National Poetry Day. The assembly was a celebration of poetry and the written word. Mrs Croucher shared some of her favourite verses with the children including poems by Alan Ahlberg, Joseph Coelho and her childhood poetry hero – Winnie the Pooh! The children were encouraged to think about the power of poetry with a story about Nelson Mandela who used Shakespeare’s verse to help him survive his time in captivity and to consider how poetry is all around us every day. We ended the assembly with the promise to all do our best to “Look like a Rainbow” as inspired by Joseph Coelho’s poem – spreading positivity and happiness to the people around us. This morning I waved off a group of Year 5 and 6 pupils who were heading to the ISA Junior Triathlon event in Essex. They were all so excited and proud to be representing their school. This is the first time that we have entered this competition. Please see our school Facebook page to hear how we got on and to see pictures of the pupils participating in this event. 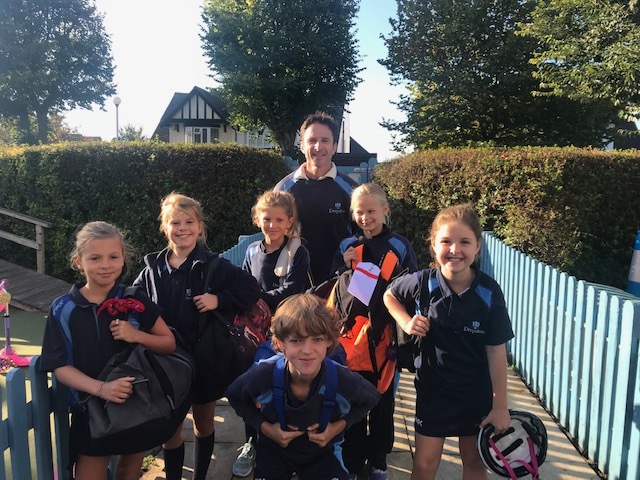 I am delighted to be able to tell you that Isabella in Year 4 has been selected to train and play in Eastbourne for the U9 Tennis County Team. What fabulous news! Well done Isabella- we look forward to following your success. Wednesday 10th October: U10 Girls Netball Fixture with Sompting Abbots at Roedean School. Open House for pupils in all year groups- Wednesday 17th October- 8:40-9:15am: Parents are invited to come into school on this morning to view their children’s work in their child’s classroom. The children always enjoy having the opportunity to share with you their work and talk about what they have been learning. We look forward to opening our doors to you on this day. I wish you all a lovely weekend and look forward to seeing you on Monday.